It is only necessary to lower the headliner. Only do those steps in the headliner replacement procedure that will lower the headliner enough to gain access to the part. Refer to Headlining Trim Panel Replacement. Remove the body side trim panel. 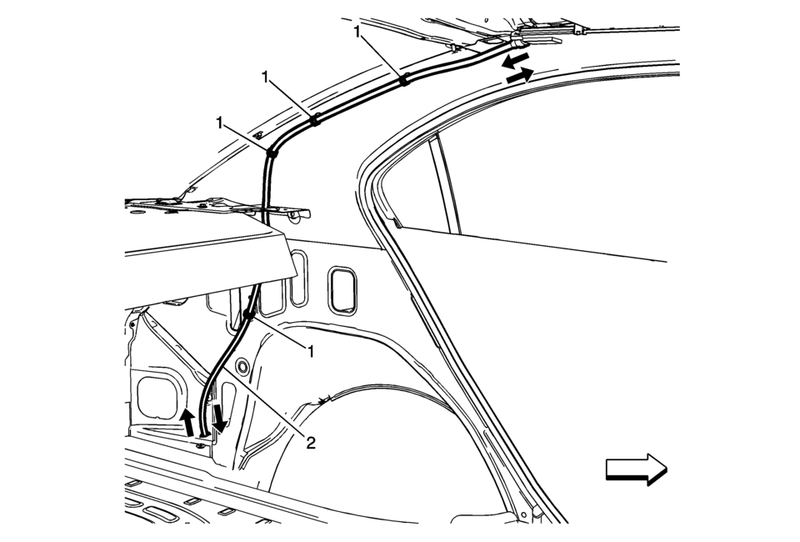 Refer to Body Lock Pillar Upper Trim Panel Replacement. Remove the rear window panel trim. Refer to Rear Window Panel Trim Replacement. Remove the rear compartment trim on the side being repaired. Refer to Rear Compartment Side Trim Replacement - Right Side. Remove the sunroof housing rear drain hose and grommet from the rear compartment quarter panel. Water test the vehicle before installing the headliner to ensure no water leaks.